Spring is in the air, and Easter is approaching very quickly, so now is the perfect time to treat your pet to a little Easter treat! An Easter favourite is the hot cross bun, but these contains raisins, which as you know are bad for dogs, and can cause kidney failure. However these Hot Cross Buns for Dogs mean your dog can enjoy a mouth-watering treat along with you! 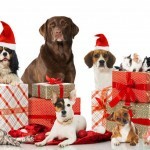 They are specially baked for dogs, are 100% dog-friendly, and contain no harmful substances. 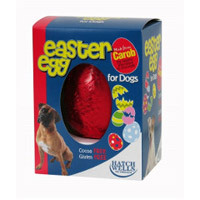 Obviously, chocolate is poisonous for dogs so they shouldn’t eat any of your own Easter Eggs, but your dog doesn’t need to miss out with this Dog Easter Egg! Made from Carob – the healthy and safe alternative to chocolate – your best friend won’t be left out when you tuck into your chocolate eggs on Easter Sunday! If you’re looking for something a little different, this small Rawhide Easter Egg from PetsPyjamas would be perfect for your four-legged friend. This edible treat is made from 100% rawhide, and is coloured with natural vegetable colourings. It also contains edible rawhide bones inside as an extra treat (or should that be eggstra?). Or how about this personalised Easter Treats Pack, which contains dog treats that are good enough for you to eat (if your dog lets you!). These natural treats use only the freshest ingredients, and everything is gluten-free, hypoallergenic and air-dried to keep the freshness in. These treats come beautifully wrapped in a cellophane bag, sealed with a bone tag which can be personalised with your dog’s name. 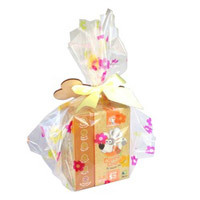 Another idea is this lovely Easter Gift Set for Dogs. This includes a bag of chocolate treats (dog-safe of course! 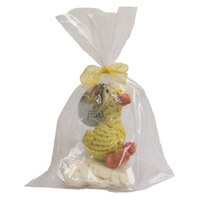 ), and a cute duckling toy made from 100% high quality cotton rope – great for dogs that like to chew! The toy is approximately 13cm tall. You can choose from either white chocolate chunky treats, or a milk chocolate bar. Both are made specially for dogs, with a reduced sugar content. 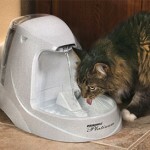 Now while most of the Easter treats available are aimed at dogs, your cat doesn’t need to be left out. 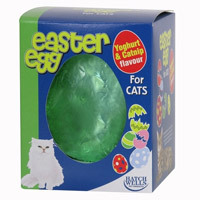 You can treat your furry feline friend to their very own Yoghurt & Catnip Easter Egg for Cats. This 40g treat is flavoured with yoghurt and irresistible catnip.